Performance Time: Approximately 45 minutes, 44 pgs. COMEDY. One day, Irving, a loveable lion, gets a thorn stuck in his paw. Due to his overbite and lack of thumbs, Irving can’t pull out the painful thorn. But have no fear because a really nice guy, Androcles, comes along and manages to pull the thorn out of Irving’s paw. But soon Androcles’ and Irving’s luck runs out. Irving is captured by hunters, and Androcles is arrested and put in jail by a very mean empress. The Empress is so mean that she won’t even grant Androcles one last meal—a chicken-and-beef burrito—before he is thrown to the lions. 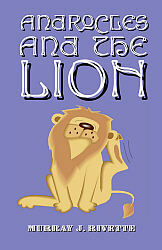 Will watching professional wrestling on TV and taking tango lessons save Androcles from the lion’s jaws? This hilariously zany retelling of the classic tale will delight audiences of all ages. Perfect for touring groups.